Maxant Extractors are Made in the USA! 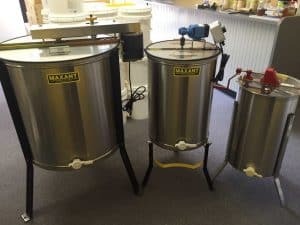 Maxant Extractors are the standard when it comes to top quality extractors that will last you for many, many years to come. Maxant Extractors are made of stainless steel. Pouring gate included. Comes with a base stand that allows a bucket to be placed under the gate. We use this in our operations. Options include: hand crank or electric.